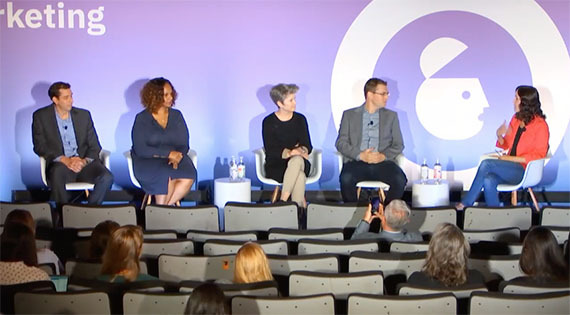 From the stage at Advertising Week NY, Rob Cosentino, SVP of Strategic Consulting at Epsilon-Conversant, joins a panel of industry experts to talk KPIs. Channel KPIs are no longer enough; today's modern marketers need to focus on KPIs that align to customer experience. This 40-minute video outlines how to use customer KPIs for accurate attribution and to make smart business decisions. Alternatively, you can read the transcript of the presentation below. Allie Woodward: Hi, everyone, my name is Allie Woodward and I'm the commercial director for the Americas at Advertising Week. There will be a quiz on AWLearn after this session because we showed it to you twice. Thanks so much for joining us for Day Two. We're thrilled to have another full day of content for you. Before I bring up our panel, I just want to thank our partners at Epsilon-Conversant for bringing us this wonderful content. Really excited for y'all to hear. So, without further ado, I want to introduce our moderator, Lauren from eMarketer. I want to now invite up the group of panelists that will be joining me for this great discussion on customer KPIs. First, we have Rob Cosentino. He's the SVP of Strategic Consulting at Epsilon. Orchid Richardson, VP and Managing Director of IAB's Data Center of Excellence. And Catrina Boisson, a Marketing and Customer Experience Strategist for Watson Customer Engagement. And then, last but certainly not least, we have Lee Boykoff, SVP of Digital, A&E Networks. Where am I going? Alright, guys. Welcome. So we're here today to talk about customer KPIs and why we're shifting toward customer KPIs and toward them away from channel-specific KPIs. It's a really timely discussion, I think. What we've seen at eMarketer, especially, over the last 12 to 24 months is this massive reprioritization and shift in focus from companies looking at channel-specific to a more holistic and customer-centric one. I think that's been a big theme that's been permeating the industry and, certainly, that has implications for how we restructure the marketing organization and the organization as a whole. So I'm excited to dig into that with all of you and talk about that. Before we do that, though, let's just, quite simply, define customer KPI. What are we talking about when we're talking about customer KPIs? What are those? What are some examples? Rob Cosentino: I'll get started. I mean, we broadly break them down into sort of two buckets, right? So it's either value-related or engagement-related. But I think, most importantly, customer KPIs have gotta be directly tied to some sort of corporate or business objective. If you can't tie it to a corporate or business objective coming out of the C-Suite, then it's probably not a customer KPI. It might be more of a metric but probably not a KPI. Orchid Richardson: Yeah, ditto to that. I'd also just think that, oftentimes, we talk about customer KPIs in the context of ROI, which is probably true, but we need to define what ROI really is. Sometimes, it's about money. Sometimes, it about the customer coming back and the engagement. And so, I think that's really key when you're actually having the conversations with the C-Suite to define what we're saying that KPI is. Catrina Boisson: And I guess I would just say that there are metrics, or KPIs, that help you understand and optimize the customer experience, so that end-to-end customer experience. And, as opposed to, although, it's critically important, because you won't success otherwise, to understand the value the customer's delivering to you. I think customer KPIs are about the value that you're delivering to your customer. So, satisfaction, engagement, that kind of thing. Lee Boykoff: I agree with all of those points. I think there's a human centricity element here, right? Brands want to connect with humans as people. And channel-specific KPIs are very easy to measure. But, really, they don't reflect that true human experience that people are having with your brands. And many of KPIs that you should focus on are leading indicators of ROI, and that ROI may not deliver for several quarters or years. Lauren Fisher: Great, so a lot of good phrases and words baked into those responses. End-to-end, customer journey, customer experience, ROI, value, business objectives. I think it's important to back up and remember that, when we're talking about customer KPIs, what we really are talking about is creating this type of customer experience and really understanding the value that we're bringing to our organization. Whether that's a monetary value or an improved value in terms of how our customers feel about us from that lens. So what are you guys seeing? How important has the concept of customer experience really become at the organizational level. Rob Cosentino: I'll start, oh, sure. If you look at the IMB CMO report which just came out a couple of months ago, right. So there's five sort of big strategic imperatives for all CMOs and three of the five are just around customer experience alone. I mean, we've seen this across the board with all of clients looking to solve for this. Orchid Richardson: Yeah, one of the things that we've been looking at at the IAB is this direct-to-consumer economy and how these brands are growing and building, and really taking over a number of the incumbent brands. They're really focused on the user experience and creating that affinity with the customer beyond just the product that they're selling. So you see it in brands like Away Luggage or Dollar Shave Club. They're really creating a lifestyle versus just here's a product. I'm going to sell it. They're trying to understand where that consumer is wherever they are in that journey. Catrina Boisson: I think the frustrating thing is we've been doing those C-Suite studies for a lot of years and every year, customer experience is at the top, and we don't seem to be making progress. Certain organizations are standouts, they're making a lot of progress. But it just sort of underlines the fact that it's really hard work, which is, I guess, why we're talking about it. Catrina Boisson: It's not easy to create that end-to-end customer experience and the more channels you layer on and the more data you layer on, the more complicated it gets. But it's the differentiator these days. Lauren Fisher: It is, and I think, to you point, Orchid, it's a necessity now that we have all of these disruptors that have really hit the space, that really understand their customers, that are creating this lifestyle. And so, it becomes absolutely critical. Catrina, it's true. It's something we've been focusing on for a long time. I think, in terms of the companies who are able to do this across all phases of that end-to-end customer journey, it still is largely early days. It's a struggle. Lee Boykoff: I think one of the things that I'm watching really closely is business models' shift toward more subscription-oriented products and services. And I think that is actually forcing organizations to think differently and reprioritize and really understand the mechanics that lead to churn. Why are customers signing up, subscribing for some period of time and then maybe cycling out? And, often, the responses that we get back do tie to customer experience. And that, in some ways, gives ammunition to go to the C-Suite and say, customer experience is no longer just a talking point. It really has this quantitative monetary value on our business. Catrina Boisson: It's not warm and fuzzy. It's not just, you should do it. You have to do it. Lee Boykoff: That's exactly right. Lauren Fisher: How are you seeing companies make that case? This is a question I get all the time at eMarketer. People understand that shifting towards customer KPIs is focusing on customer experience as really important. The challenge is we don't know how to get everyone onboard. How do we sell that up to the CEO? How do we sell that through the organization? bought it for a billion dollars. And the reason that they did it was because the smart people in the company, the disruptors within Unilever were willing to make the case using the data and presenting how to grow their brand. Where do we find our next customer from? How do we create loyalty? So I really think it's about leading with the data first and really taking a data-centric approach to how you're communicating to the C-Suite. Rob Cosentino: That's one of the things we see, this relationship that's sort of between three components, right So it's the corporate objectives coming out of the C-Suite. CMOs gotta make some case. He's investing millions of dollars to solve for some sort of customer experience problem. And we've got customer-level KPIs. So all three of those are sort of intrinsically-related and you sort of need all three of those, especially, the customer KPIs to prove out the model of the investment. Catrina Boisson: Yeah, I agree with the data point 100% from my experience leading a marketing organization where I had a CEO who said, sales were sort of flattening out and it's an acquisition problem. Go find more customers. And when we looked at the data, we found out we had leaky bucket And, really, that was the impetus to sort of dig in and understand who are the most valuable customers, why aren’t we retaining them in the way that we should, and what's it going to take to accomplish that. But it started with the data quantifying the problem. Lauren Fisher: It's interesting when you think about it in that perspective. I think a lot of companies do initially think, oh, we need more customers. We need to fill the pipeline. We need to get more people in. But when you really do think about that end-to-end customer experience and we understand that it doesn't just stop at the purchase. You know, we have to really foster the loyalty and, hopefully, some advocacy in there, as well. Then, it really does become about that entire holistic customer experience, that entire relationship that your customer has with your brand. From a customer KPI perspective that leads us to very tangible KPIs, right? We can look at revenue. We can look at sales. But we can also look at things like brand affinity and lifetime value and loyalty. Do you feel like, for a KPI to be effective, it has to tie to actual revenue, or can we look at some of those other forms of ROI in terms of loyalty and lifetime value? Rob Cosentino: What we've seen with our clients is we've actually proven that, if you can move some sort of customer engagement KPI, if you can move the needle on that, what we've seen, we've proven out six to 12 months down the line is there's actually a direct relationship with moving a more value-based KPI. So you have to focus on the engagement first, recognizing that the increase in value will come. Catrina Boisson: I think the key is that it's got to be actionable. So, you know, NPS is sort of a gold standard. We talk about it all the time in the context of customer experience. But you need to be able to unpack it and understand if the Net Promoter Score is high or it's low, or it's high with this segment, low with that, why? Can we unpack it and actually be able to take action? Otherwise, I think that the organization is not as motivated. Lauren Fisher: Okay. In terms of unpacking it and taking action. I think one of the challenges comes from, we're look at the customer KPI, we're understanding what that means for the business. But now, we have all the channel managers who are operating all of our marketing programs. We have other departments, right, who are involved in this end-to-end customer experience who needs to understand what this KPI looks like for them. How are you seeing companies navigate this tricky relationship between the customer KPIs and the channel-specific KPIs which, on some level, may look entirely different? Something about lifetime value is hard to translate to a channel like search or retargeting. What are companies doing to make this work? Rob Cosentino: I can start. Channel KPIs are incredibly dangerous, right? So what we've seen is most CMOs are looking to, essentially, create some sort of more customer-centric organization. And channel KPIs work in the opposite direction. So there's channel KPIs. There's compensation tied to those channel KPIs. And, therefore, it's incentivizing a very channel-specific behavior and decision-making. And all that leads to sort of like re-entrenching sort of channel or product-based teams within a marketing organization which is the exact opposite of what a CMO is trying to do. So they are very dangerous and I think resetting the expectation of when and how you make decisions off of channel KPIs is one of the first things that can be done. Orchid Richardson: Yeah, and I'd even go a little further to say that you really have to tie the channel KPIs to the overall organizational goal, right? So it doesn't make sense to pay someone a bonus or whatever the incentive that the employee has to meet their channel KPIs if it doesn't lift the overall organization and it's not moving forward with their protect customer retention, or growing new products, or finding the next customers. So it really is important to take, to define what the channel KPIs are in connection to what the overall organizational KPIs are. Lee Boykoff: I would add, I don't think that KPIs are necessarily always in conflict. And you mentioned search and retargeting, right? So it is no one's best interest to retarget a customer who's already converted, or a prospect who's already converted. I think, as consumers, we see this all the time. You get hit with some sort of abandoned shopping cart campaign but, in fact, you weren't abandoned, or you actually already converted. There's some sort of lag in the ecosystem. The person who is leading your retargeting channel doesn't want that impression delivered. It's not making them look good. And so, I agree that sometimes channel-specific KPIs will create friction and pull against the overall organization objective. But, often, it's really just thinking about how your data flows through the system. Another examples that I've seen is when you do a search to unsubscribe, or cancel, or return a product, and then the acquisition team hits you with a paid link that says, come sign up for this product Again, I don't think that paid search manage wants that ad showing in that moment. So there are some easier solves to thinking about the customer journey. Catrina Boisson: I think it comes down to the difference between multi-channel philosophy and omni-channel. So multi-channel, you've got all of these different silos and they're running fast towards there objectives, whereas omni-channel, it's that idea that every channel knows what's happening in the other channels. That you don't have that retargeting ad a wasted impression or sort of tone-deaf as far as the customer is concerned. Lauren Fisher: And that takes a lot of effort, right? You have to have the people in the organization aligned to work in that omni-channel capacity. You need the technology to talk to each other. The technology needs to know, this person converted, don't show them an ad. And the data, as well, also needs to be aligned. I think this is what makes this so tricky, is that there's those three pieces of this puzzle that really need to fit together. And, oftentimes, the reality is you have trouble making them fit together. That's especially true when you're looking outside of marketing. And, again, when we're looking at the end-to-end customer experience, we realize that marketing, oftentimes, only touches certain phases of that customer life cycle. If you're looking to cancel or you have a problem, you're probably looking for customer service, right? Depending on the structure of your organization, a sale is exact, or an account manager may play a role in delivering on the part of that customer experience. So it definitely becomes a challenge for the marketing department and the organization at large. How are you seeing companies manage some of these life cycle gaps, especially, looking across departments? How are they getting these departments to work together? Rob Cosentino: Partly, two things. I think one's identification. We've worked with clients and we've said, okay, what are all the way that you're sort of engaging with customers? And they come back with a list of a hundred campaigns or programs. And then, we do an audit and find out there's more like 200. But if you match them up against a pretty robust life cycle, anywhere from 15 to 20 different life cycle phases, in most instances, about a third of those phases are left completely empty. So just understanding where the gaps are, first and foremost, are important. And, in terms of bringing them together with other marketing teams or other parts of an organization, it's actually, it's pure-play organizational strategy. And I think a lot of CMOs are becoming very good at tac, they're becoming very good at data. The notion of work strategy and process is still something that's not fully in their comfort zone. But it's, oftentimes, one of the critical points of failure that you've got to solve for. Orchid Richardson: So I think it's really about transforming the organization so that it becomes date-centric. And sometimes that requires new people, new processes, new systems. And companies have to be willing to make the investment in that. Oftentimes, there is a fear of making the investment because it may not work or, you know, different reasons why people don't want to make that change. But it really comes down to identifying the gaps in personnel and hiring people who can help make that organization more data-centric. Catrina Boisson: And, I guess, in my work with clients, I do a lot of workshops that design thinking-focused and end up with journey-mapping exercises. And that a really valuable exercise as long as you get that cross-functional, cross-organizational representation in the room. So it's marketing, it's sales, it's service, it's IT, it's the analytics folks. So that they can kind of begin to build consensus around the experience that they want to deliver and then walk out feeling like this isn't the marketing's flavor of the month project. We're all invested. The key then becomes operationalizing that journey map so it's not just a pretty mural sitting on the wall. Lee Boykoff: It's cultural and, in order to be successful, you need leadership to buy in. It can't just happen kind of at the ground level. Lauren Fisher: Yeah. We're at an interesting point in the digital advertising and marketing space today when I think a lot of things are coming to a head from a cultural perspective. And for organizations to continue to pivot and shift, it isn't...We talk a lot about the technology and the data and making sure that we're on top of it, that we understand it, that we can put it together. We're trying to fill those holes and hire the right people. But I think that organizational structure and the human capital is such an important piece of this that I think gets left on the table. And we see that with customer experience. We see that in a variety of other areas of digital advertising and marketing. So I think this is really Step One, right? You can invest in all these systems. You can get the right data. But if you do have the right people who have set this up to follow through, if you don't have a realigned bonus structure and compensation structure, then it's just going to fall flat. Rob Cosentino: Actually, a quick note on that. It's really about protecting the investment, right? So most people are, most SVPs and above are investing in sort of marketing data and marketing technology, right? But if you don't solve for the people and you don't solve for the organizational strategy, you get low adoption. If you get low adoption, what you do is you've got somebody in the C-Suite that just spent millions of dollars on something and it's not taking. Also, now, they're at risk. So solving for those software issues around people and process are critical to improving the ROI. Orchid Richardson: Right, and I think it's, so the people point. It's making sure that everybody understands that they're tied to the data, right? So even if you're making a marketing decision, it should be data-driven marketing. Or, if you're making a hiring decision, it should be data-driven HR. It's really important that data doesn't just live with the data analysts in some room down the hall that nobody ever talks to and sees as a problem, but everybody owns that relationship with the data and using it to drive the business. Lauren Fisher: So it truly is a new approach, a new culture? Orchid Richardson: It's totally is a new culture today. Lauren Fisher: Yeah. And to your point, Catrina, about the journey-mapping, you know, that's having everyone in the room; in all over these situations, you're having every piece of the organization buying in, not looking at this as a marketing-specific tactic, because it really isn't just about marketing. In the presentation that we saw before this, there was a quote from FCB about how good advertising is written from one person to another. And when we think about the customer experience and customer journey, I think the promise of digital advertising and marketing is trying to have that one-to-one relationship, that one-to-one customer mapping. For this type of customer-centric approach to work, do we need that real identifier, that single customer identity to make this work or can we do this even if we aren't really sure of who that customer is in all of these different touch points and channels? Rob Cosentino: I think today most organizations are struggling with getting that sort of omni-channel experience just within sort of directly or more marketing-based channels and they're still working very hard just to solve that. Then you add in the advertising or, since you're sort of the anonymous space; and that's really when you need it. I mean, you need some sort of bridge solution to link sort of like the non-PII with the PII data. So there's a lot of gains to be made today. But, eventually, you do have to solve for that, especially, if you want to integrate it with a sort of unknown in advertising. Orchid Richardson: Yeah, I'd say 100%. 90% of what we're doing at the data center today is helping marketers define that identity across media, across channel. Whether it's working with big companies like a Live Ramp, or working with the media math; really trying to figure out how do we find that use and know who we're talking to because it's so critical, that one-to-one connection in terms of how you grow your business moving forward. Catrina Boisson: And I think sometimes organizations get really focused on that golden record or single customer review; one place where everything lives. And when other people start moving down that master data management path, I encourage them but say, that shouldn't stop you from getting started, because there are lots of other ways to leverage data where it sits right now, access it and, again, to build an understanding of who you're talking to without maybe having that golden record which could take you longer than painting the George Washington Bridge. Then, you start over again. Lee Boykoff: I think about it from the perspective of relevancy and communications. You know, at A&E, we have a portfolio of brand A&E History and Lifetime. Each of those brands have sub-brands which we think of as individual TV series or franchises. And when a consumer opts in to have a relationship with us, it's like that they have an affinity for one of those sub-brands. But they're not necessarily interested in hearing about all of the different shows on all of our networks. And so, we're moving from a place of batch-and-blast to that one-to-one customer relationship. That said, there are many, many gaps in the ecosystem that prevent us from having a single identifier at every touchpoint. The number one way that we touch our viewers is through traditional television and that is not a one-to-one mechanism with data collection enabled at the census level. You know, we talked to our viewers in walled garden environments that don't allow us to sync ideas. So the way that I've approached it is to say how do we get more relevant tomorrow than we were yesterday and not obsess over putting everything against one single database with a single identifier. Catrina Boisson: Yeah, and relevancy is not the same as personalization. I mean, you don't have to say, Hi, Lauren, or something else. It can still be relevant. Lauren Fisher: I think that's a great point. You don't necessarily have to have that one-to-one relationship to still be very relevant and deliver a powerful customer experience. One question I have about that has to do with the future of getting at some of that information and customer data. I think we are entering a time where we've seen studies that suggest that consumers are increasingly distrusting of how companies are handling their personal information. In certain cases, and marketing would be included, at times, they can be reluctant to share information with companies if there not sure how companies are using that information and what they're using it for. In the European Union, we have GDPR, right? This is exactly getting at some of this concern and trust that consumers have had over this over the last several years that's built. We now have in California, the Consumer Privacy Act that, in 2020, will enact some sort of GDPR-esque type rules and regulations over how companies handle and collect consumers' information. What are the potential implications of this from a customer experience perspective? Are there things we need to be thinking about as companies as we move forward into a world where, realistically, it may be harder, on some levels, to understand who are customers are in all of these different channels? Catrina Boisson: I'll take the glass-half-full perspective and say that GDPR and concerns about privacy, it just makes customer experience that much more of an imperative, coming back to one of your earlier questions, because if you, as an organization, as a brand, can truly demonstrate that there's an exchange of value, give me your data, let me use your data and I promise you what you get in return is going to be relevant and meaningful and not spam. It's kind of an opportunity to build that trust from the ground up. So I'll be an optimist. Orchid Richardson: Yeah, I think I'm falling in the optimist category also. It really is about being transparent with the consumer in what you're doing with their data. You can see that from within the direct-brand economy. Consumers are voluntarily sharing their first-party data with the brands because they understand the value proposition that happens. When they're talking, they're able to talk directly to the customer. And because they value talking to their customer, they protect that data at all cost to make sure that they're not jeopardizing that relationship. And, really, when you think about it, when you look at how the digital ecosystem is growing, that one-to-one relationship with the brands and the customer knowing that there's a trust there, if that goes away, that whole economy collapses. And that's really what GDPR speaks about. It's about making sure that the consumer has raised their hand to say they want to participate in this digital landscape, and reminding them along the way. Lauren Fisher: And from a relevancy perspective, I think it's hard to want to establish a relationship with someone who doesn't want to raise their hand. So, the longterm, this can be a very good thing for companies who really put this into practice and lead with this vision of creating value for their consumers and being open and transparent about what that actual value is. Next, 12 to 24 months, the road ahead; expectations, positive things that should come, continued struggles, what are you guys thinking? Rob Cosentino: I was going to say, I mean, there's a lot of work to be done, right? I mean, we've seen some of our clients make truly heroic efforts at solving critical customer experience issues in a short amount of time. And we've seen them sort of move a marketing organization faster than I think I've seen marketing organizations move in the past. And, even then, we're only solving probably about 20% or 30% of what, ultimately, we've got to solve for for the CMO. So I think it's picking up speed. I think we're making a lot of progress. I think there's still a lot of work to be done out there. But I'm, overall, very optimistic. I like where things are going. Orchid Richardson: I think I'm excited about the next 24 months, especially, as a lot of the incumbent brands become smarter about how to use data. So it'll be interesting to see how that evolves the ecosystem even more. I think that, right now, they are waking up in terms recognizing that the direct-to-consumer economy is something real that they need to take advantage of. So I'm excited to see how that's going to force the incumbents to change me better. Lee Boykoff: I think the consumer expectations are evolving and I think relevancy and personalization are generally expected now of large brands. And that's going to force incremental investment. I think what I'm really fascinated by in the connection of digital data points to historically, would have been offline data point. Smart TV is an area that's sort of near and dear to my heart. But I also look at brick and mortar retail and it looks like that's an area that's ripe for innovation and ripe for more relevancy-focused solutions. Catrina Boisson: Nothing to add. Questions? I think we had some questions come through. We did. So, panelists, let's start with this one. What bonus structure have you see work the best to incentivize cross-functional teams to focus on improving customer KPIs? So are there certain structures or compensation models, if any of you have experience with this that you've seem to motivate everyone to play nice? Rob Cosentino: Yeah, there are, actually. We've seen this in sort of a handful of cases and I think it's picking up sort of a lot of attraction. But you're basically de-emphasizing a lot of that very channel or tactical-based KPIs and you're working towards a common set of customer-level KPIs, right. And you're actually incentivizing various marketing and advertising teams to start stitching together that customer experience across the team. And, from a comp standpoint, you actually reward them on checking off the box and making those initiatives happen. So we've seen it. It's a distinct change of behavior once you implement those. So it's a lot of fun to watch. Orchid Richardson: Yeah, so in my prior life, prior to joining IAB, I used to run sales teams. And one of the things that was always a challenge is that the sales teams was motivated to sell something, right, and they had to sell regardless. And they sold regardless of whether or not it could be delivered internally. And so, what we did is we changed the structure so that the sales person got paid off of whether or not the sales support team could actually execute what they sold. And so, they both became tied to whatever went out the door with something that was good, because you wanted to sell as much as you could of whatever that was, and that it was deliverable. And so, once we made both of them tied together, it helped raise the whole sales organization as a whole. Catrina Boisson: Well, I also think you mentioned the subscription economy and it's sort of pervasive across a lot of different industries. And that does shift the attention away from just acquisition to retention and for people to be rewarded, not just on bringing in that customer, but the organization's ability to keep them. This one gets a little bit at our discussion of personalization versus relevance. How should companies have one-to-one relationships with customers in a way that's scalable. Catrina Boisson: Maybe I'm biased but I'll say technology helps a lot. And we're on the Watson Stage so I can make a pitch for AI. Orchid Richardson: I definitely think it's automation, AI, machine learning, whatever we'd call it today. And that's what you see in the direct-brand economy. That's how they're winning. They're really relying on the technology to drive the conversations on the one-to-one relationship with the consumers. Lauren Fisher: And I think, as well, we established that there are some cases where you can't always have that one-to-one relationship but you can still be relevant. Anyone have expertise in B2B? They want to talk about the top-three customer KPIs which must be tracked? Rob Cosentino: Yeah, I think we, what we see with our B2B clients, and it goes a little bit to what Orchid was saying earlier in terms of, if you can tie together KPIs, which, essentially, ties together like an inside sales organization, with the field sales organization, with the marketing staff. And I think that's what we've seen. And we've seen too many situations in B2B. It's natural for sales to be thinking one things and marketing to think another. So if you can sort of set up that common set of KPIs and then change the structure to match that, control that working together. The other thing, particularly, with B2B is sort of mobile-enabling the sales force. The biggest challenge is essentially getting all the insights and all the data, traditionally, residing with the marketing department and sort of getting it mobile-enabled in the hands of the sale force. And I think that's one of the biggest KPIs you can measure against from the initiative standpoint. I like this one. Regarding the complexity of the omni-channel environment, what skills do you believe are core for your team members for building successful strategies? So getting back to that people part of this equation, what do those people need to have to make it work? Catrina Boisson: You know, I always wondered whether there was going to become, maybe in some organizations that exists, a role of sort of the Experience Designer. That person who is sort of stepping back, and I don't know if orchestrating is the right word, but conceptualizing what that end-to-end journey across the channel might look like and then bringing the players together to actually figure out how to implement. Execute. Lee Boykoff: I think team members need the ability to empathize with the customer. You can't put yourself in the customer's shoes and walk through that journey and really understand their mindset. It's going to be really difficult to understand holistically how each other these consumer touchpoints impact the broader relationship that your brand has with that customer. Rob Cosentino: And I think, to Catrina's point, it's interesting. We are seeing a lot of people sort of emerge as like journey managers and they're owning some sort of customer. And I think the first instinct is to put a big piece of technology in front of them and sort of let them loose, which is good. That solves about 80% of it. But I think, from an actual skills standpoint, I think grooming people to be like truly agnostic data-centric marketers, that's who you need in that role. And it's tough. Most marketers today have grown up in some sort of channel environment and so their bias is always that way. So we've found a lot of skills training onsite is one of the ways to help people to think about things in a more customer-centric way. Catrina Boisson: Well, you know, we've been talking all about channels but you mentioned product which I think is another huge silo in most organizations whether it's A&E or whether it's a bank where the mortgage people have their KPIs and the credit card people have theirs. So, again, being able to put yourself in the customer's shoes and understand that they have needs for those different products at different points in their time, in their lives. Lee Boykoff: And, generally speaking, you need a great product that is differentiated from other products in the marketplace before you can even begin to think about all of these sub-elements of the user experience and customer journey. It really is table stakes. Leaking buckets. How do we know if our bucket is leaking? So if there's holes in that life cycle, how can we even identify that? Rob Cosentino: Really good analytics. And analytics aren't just reporting-style analytics. I mean, analytics that are truly diagnostic analytics to understand where is revenue coming it, where's it coming out? Where are you losing your best customers? Where are you gaining your best customers? And I think most organizations stay, from an analytics standpoint, it's probably 80-20. They do skew more towards a reporting standpoint and just don't have enough of that good diagnostic analytics. So that's something we see work very well. Lee Boykoff: I think asking customers why they're unhappy doesn't require a team of data scientists and it can yield incredible insight as to why you may have a retention challenge. Lauren Fisher: I think the journey-mapping exercise is an important one, too, to really see it out there, all of the ways that people are engaging with your company and really moving throughout that life cycle can often be telling of where there are holes or understanding where you might need to double-down on certain efforts or add new touchpoints and channels that you hadn't before. Anyone want to talk about attribution, building attribution models based on NPS. Rob Cosentino: I think we'd need a whole session for that. Lauren Fisher: Yeah, attribution is always a really tough one. I think, for a measurement perspective, again, this is about building something that's holistic and crosses the organization, right? We're not just pulling in marketing data. We're not just pulling in marketing channels. We really are looking at all the different data points that we can get from across the organization to see how all of this is playing together and what the true effect is. Lee Boykoff: I love that you use the word, holistic. Lee Boykoff: Because one of the common flaws in attribution modeling is that there is some sort of customer touchpoint that's simply not incorporated into the model. And so then, credit gets shifted around inappropriately. And there's some channels that are almost impossible to measure. So that's where I think the hybrid of sort of the media-mix modeling of yesteryear and the attribution modeling of today can complement each other really nicely. Thank you so much for chatting with us today. This was great.